Greenhouse gas emissions fell by less than 1pc last year due to warmer weather, less fuel tourism with Northern Ireland and increased output of renewable energy. But the Environmental Protection Agency (EPA) says that emissions rose in the agriculture sector by 2.9pc because of higher cattle numbers, and warned that the overall emissions drop may not be sustained over the longer term. The report shows that the State is off track to meet its EU 2020 targets, despite a drop of 0.9pc in emissions last year. Agriculture emissions rose by 2.9pc, but transport fell by 2.4pc, power generation by 6.9pc and household by 5pc. The State currently generates almost three million tonnes of emissions above the level needed to meet our legally-binding targets. In 2017, some 60.75 million tonnes were emitted, down 530,000 tonnes on 2016. “The main factor underpinning lower transport emissions was a fall in cross-border fuel tourism due to currency fluctuations,” the EPA said. “The increase in agriculture emissions was mostly due to higher dairy cow numbers. Lower household emissions reflected a warmer year in 2017 with less heating required, especially during the winter months. Director of the Office of Environmental Sustainability, Dr Eimear Cotter, said while the drop was welcomed, particularly as the economy continued to grow, there were questions about falls over the longer-term. 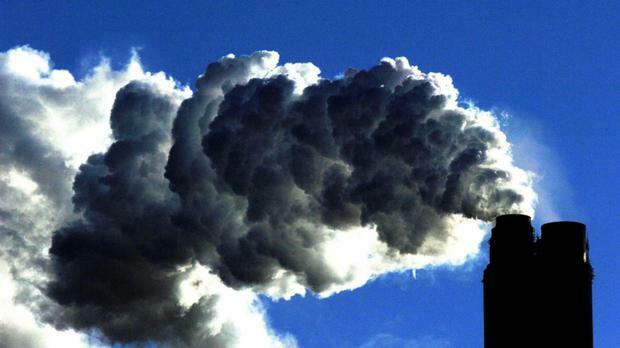 Official government policy is to reduce emissions by 80pc over 1990 levels by 2050, but increased economic growth threatened these long-term goals, the EPA added. It says that agriculture emissions increased by 2.9pc in 2017, up 570,000 tonnes, driven by higher dairy cow numbers which increased by 3.1pc which reflects national plans to expand milk production. “Dairy cow numbers have increased by 26pc in the last five years while greenhouse gas emissions from the sector increased by 10pc over that time. This shows that agricultural production has gained some efficiency over this period but that we have some way to go before full decoupling,” the EPA said. Transport emissions fell by 2.4pc last year, or by 290,000 tonnes, after four years of increases. “Total road transport fuel sales decreased by 1.1pc in 2017, however, when considering cross border fuel tourism, total fuel used by Irish motorists continued to grow by 2.1pc. This is driven by economic and employment growth,” the EPA added. While demand for electricity rose by 1pc, emissions fell by 6.9pc. Drops were seen in coal, which fell by 21pc, and peat (down 6pc), while renewables increased due to more favourable weather conditions. Wind output rose by 21pc. “The overall impact is that there is a 9pc decrease in the emissions intensity of electricity generation (from 480 g CO2/kWh in 2016 to 437 g CO2/kWh in 2017 which is the lowest carbon intensity on record,” the EPA added. Climate Action Minister Richard Bruton welcomed the emission cuts, but highlighted that the State was “far off course” to meet its international obligations. He said he was committed to developing a cross-Government plan and make Ireland a “leader” in tackling climate change, and which would focus on implementation with clear lines of responsibility. “I welcome the fact that Ireland’s emissions are decreasing, however we are still off course to achieve the targets we have committed to,” he said. “We have stabilised usage in the residential, services and energy sectors. However, since the recovery, we haven’t succeeded in breaking the link between economic progress and emissions in the industry, agricultural and transport sectors. The reality is that we are 95pc off course to deliver on our 2020 targets.